Not too much to report today. I did meet an electrician named Mike and a plumber named George. They came separately but both used the word "complicated" when referring to the work they needed to do. Hmmmm... does that translate into more money? I assume so. Neither guy started working. They just stopped in to see what work they would need to do. I thought maybe they would start work. Thought, hoped, prayed. Guess not. I wonder now if they originally didn't plan to start anything today... or if they planned to start, but quietly ran away screaming from some issue I'm unaware of. Both guys said they'd contact Handyman Matters and they'd let me know their work schedule plan. I'm just loving the whole process of remodelling! Fun fun fun. Anyway... I don't want to leave you with no pictures. Homemom3 over at I'm not just a Mom... 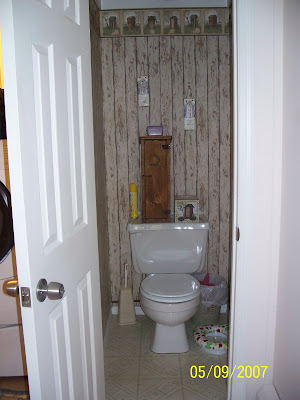 I'm a home mom asked me if we had another toilet. (The comments she's leaving make me think my bathroom remodel is making her nervous. It's making me nervous too!!!) 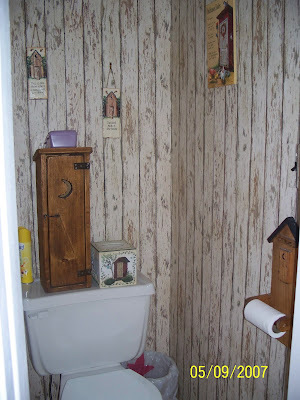 So here are some pictures of what we like to call our Outhouse... only it's inside. It's the comedy section of our house. What do you think? We do also have a small shower that technically belongs to our tenant. (We rent out a room with bathroom attached.) While he was at work today I popped in and took a quick shower. Zoe had a bath at Grammy and PopPop's house on Monday... and tomorrow she has a bath time date with her cousins, Alex and Larisa. So don't worry about us... we might be living in a construction zone... but at least we smell nice and I'm not being forced to squat behind a bush in the yard! Hopefully tomorrow we'll have some more progress to report. If not... I'll have to come up with something else to tell you!